In a small bowl, mix ground ginger, honey, garlic, lemon juice, and hoisin. Mix together and slowly whisk in olive oil and ground pepper to taste. Spray a baking dish with PAM and place salmon filets skin side down on baking dish. 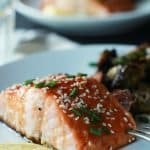 Pour hoisin honey glaze over salmon filets. Bake for 15-20 minutes until flaky, deglazed (spooning glaze back over the salmon) every so often to keep moist. Serve with sesame seeds and chopped chive garnish.